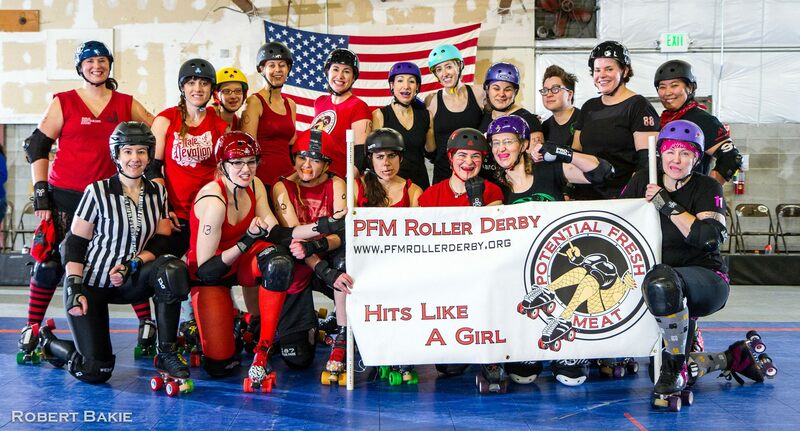 Coconut Curry Lentils w/ Miso & more derby pix! This post is long overdue. 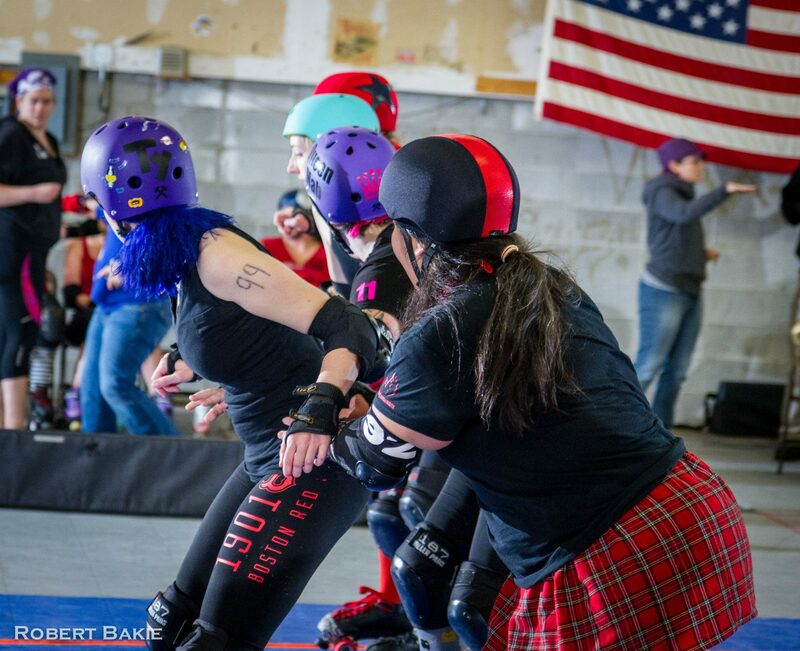 I’ve been slacking both on the blog, and in actual derby for the last week & a half, but I’m going to try to knock this post out today, AND go to derby practice tonight. 🙂 I’ve also got a little soup recipe for you. 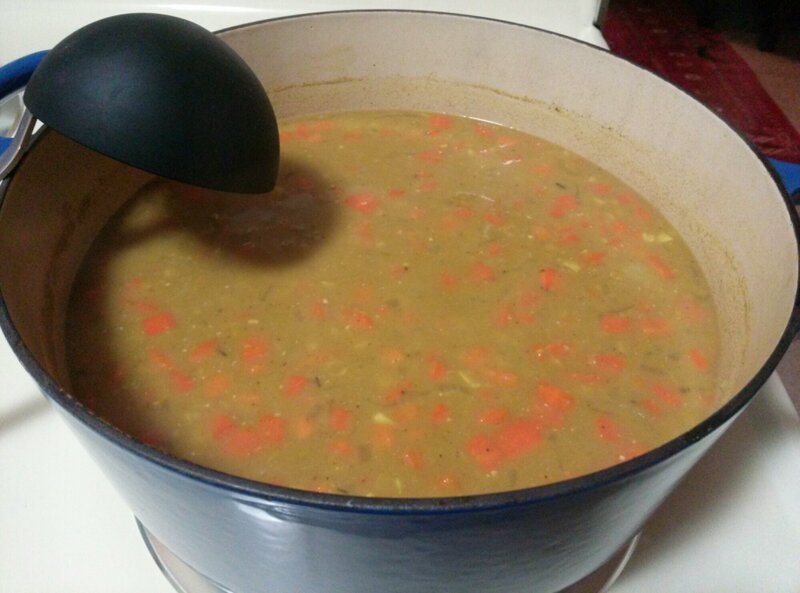 Another lentil recipe that doesn’t use any broth or bouillon (because we were out!) but still delivers lots of rich flavor from the coconut milk, spices, and miso. A perfect hearty meal after a tough practice! 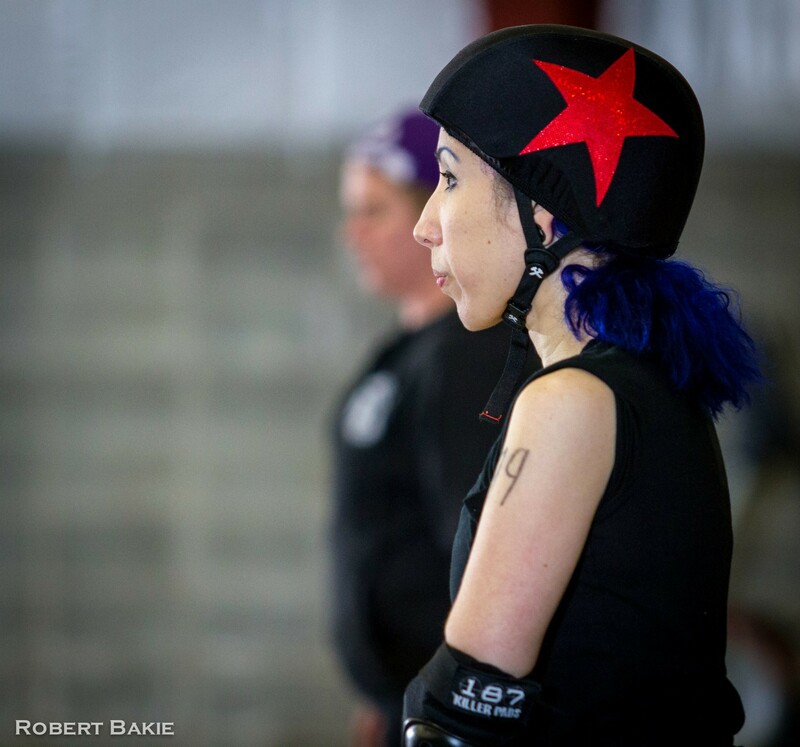 I’m also gonna include a few more pictures from scrimmage since they were so wonderfully snapped by the talented new hubby of one of our girls, Mr. Robert Bakie! 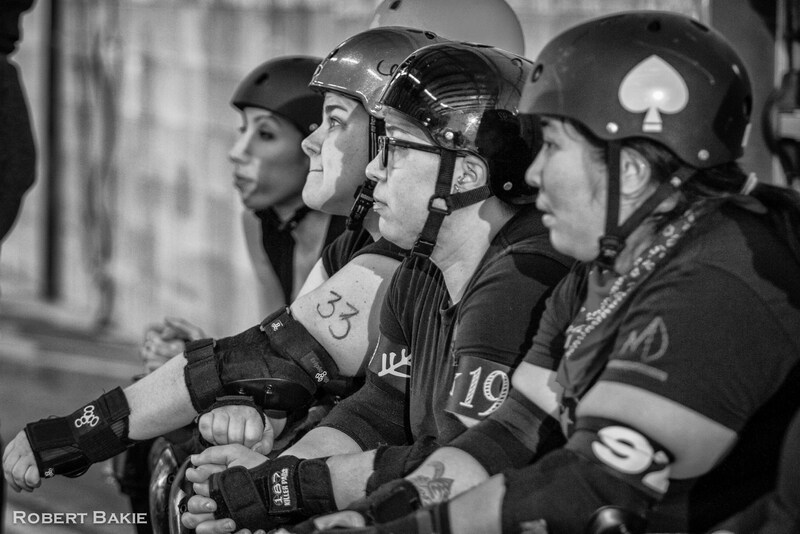 Team Black on the bench. 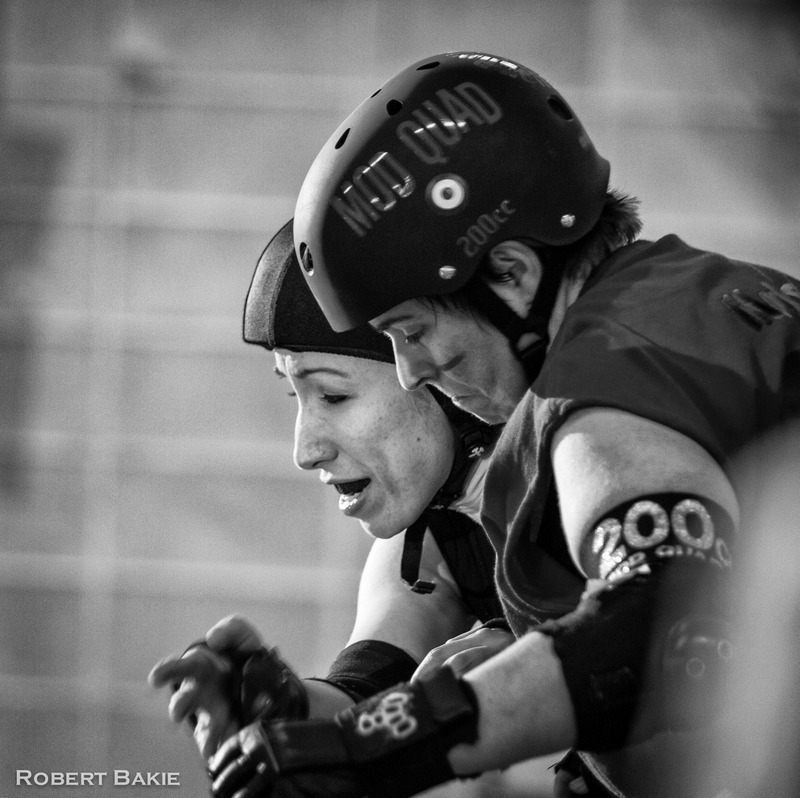 Mod Quad and I, battling it out! 1. Mist a large pot with olive oil and raise to medium heat. 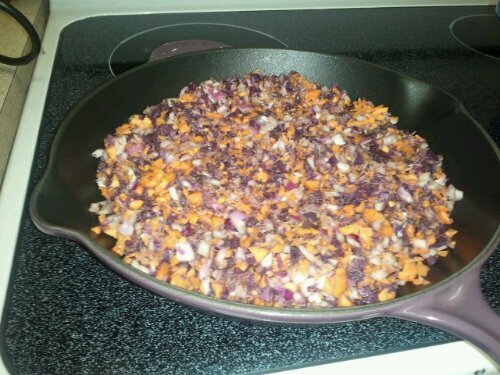 Add onion and cook until softened and just a little caramelized, about 7 minutes. Add garlic, and cook for another minute. Deglaze pot with water and coconut milk. 2. Add all other ingredients except for miso. Raise heat to boiling, cover, and drop to simmer for 45 minutes. 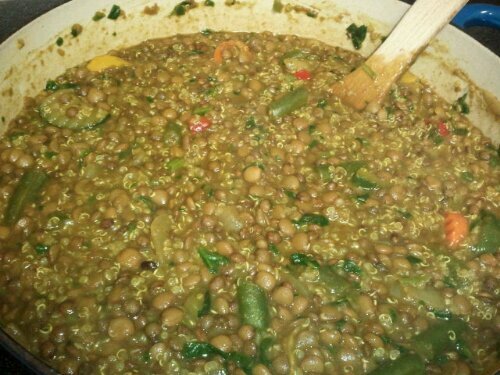 Taste for seasoning and simmer another 15 minutes, or until lentils are fully tender. 3. 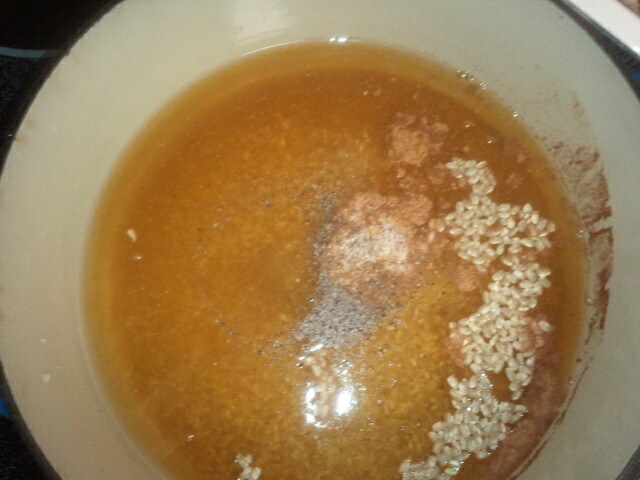 Remove from heat and stir in miso until it’s dissolved. Done! Okay, this is the second time I’ve made this dish, only this time with a lot more oomph! 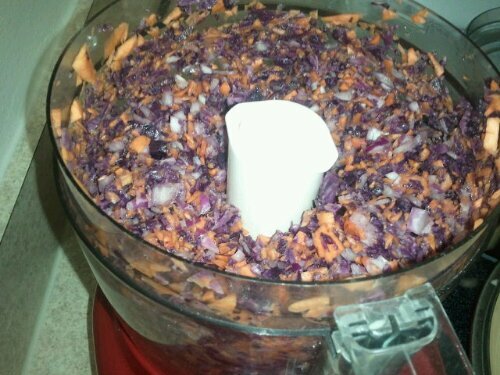 The first time I made it, I had intended to make a similar Veganomicon dish, but didn’t care for the flavor profile. This time I used the same spices I jazzed it up with before, but took it up a notch. It takes about an hour total, but most of the time is inactive, so it’s a pretty simple dish. It’s also a good way to use up onions, because it takes 3 big ones! 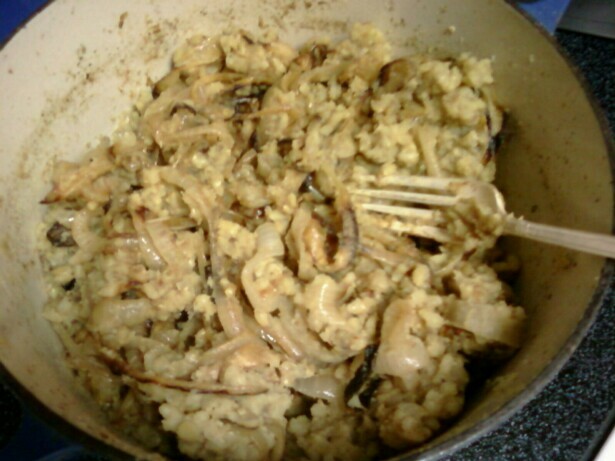 I used yummy sweet yellow onions. 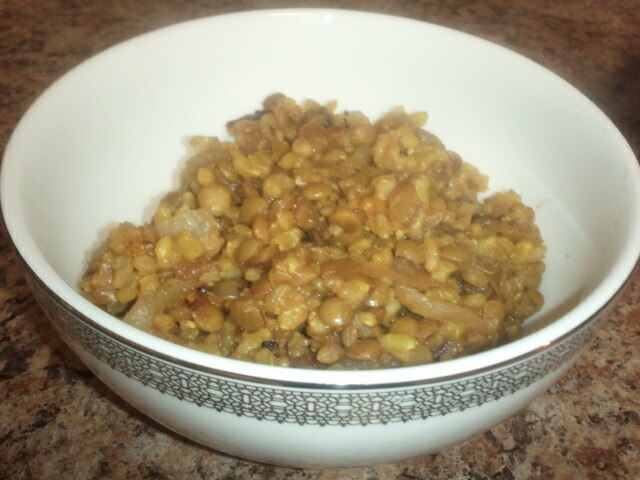 I also used regular brown/green lentils here for heartiness. 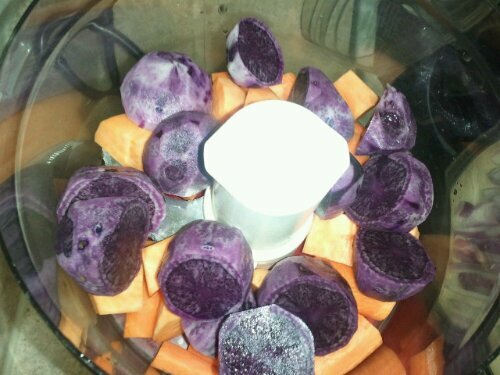 You can use red ones; just know they will mush into the dish as you cook them and be sort of indetectable. I like the different textures together here. 1. . Pre-heat oven to 400*F. Prepare and spray baking pans with olive oil. 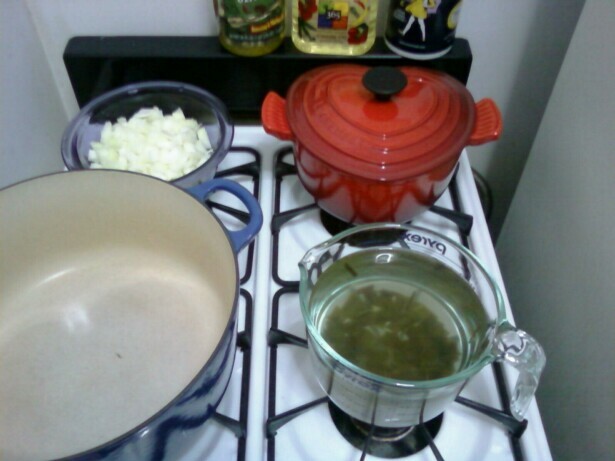 Add onions to pans, spraying with more olive oil and sprinkle with salt. Bake for 30-45 minutes. After this time you can drop the heat down to 200*F, and let them cook until the rice and lentils are ready. 2. Bring 4 cups of water or broth to a boil in a medium pot. Add all spices, and add brown rice. Drop heat to low, cover and simmer for 15 minutes. 3. Bring back up to a boil and add lentils. Cover and simmer for 30 more minutes. At this point, most of the liquid should be absorbed. 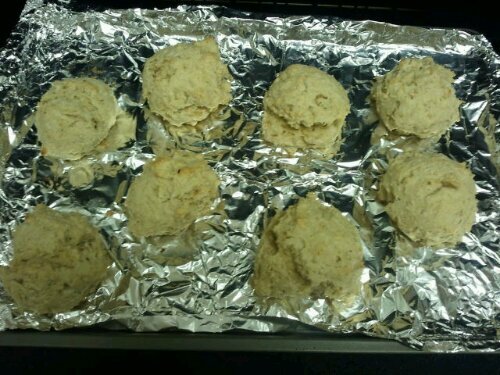 Remove from heat and let sit for 5 to 10 minutes. 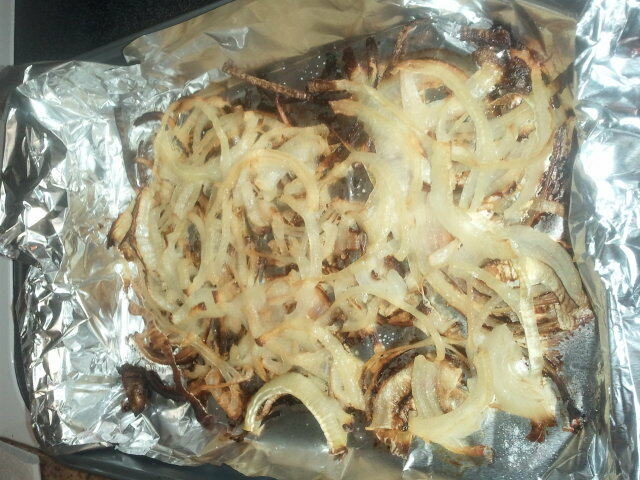 Fluff and fold in caramelized onions. anyway, this is a little time-consuming, but is not really a lot of work. plus it used the 3 large onions i was worrying would spoil, and has fed me all weekend. score! 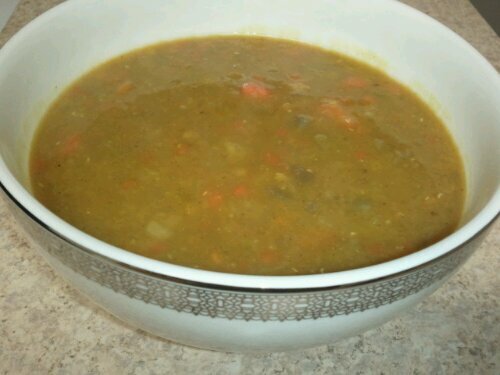 ps- you can use any kinda lentils you want. i used red ones, which is why you can’t see them in the end result because they tend to mush when cooked. if you use another color, they’ll hold their shape. 1. Pre-heat oven to 400*. 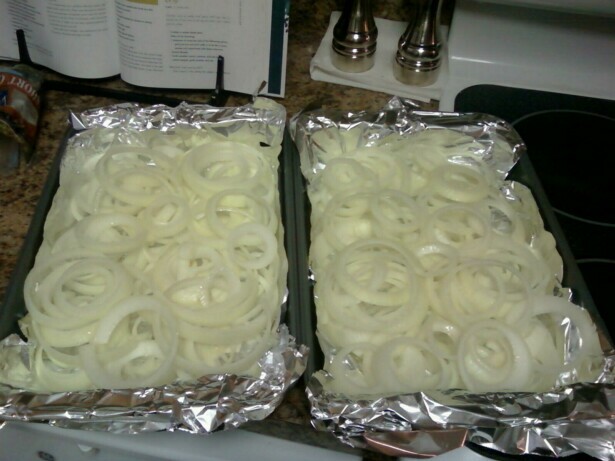 Prepare and spray baking pans with olive oil. Add onions to pans, spraying with more olive oil and sprinkle with salt. Bake for 30-45 minutes. 3. Bring back up to a boil and add lentils. Cover and simmer for 30 more minutes. At this point, most of the liquid should be absorbed. Remove from heat and let sit for 10 minutes. 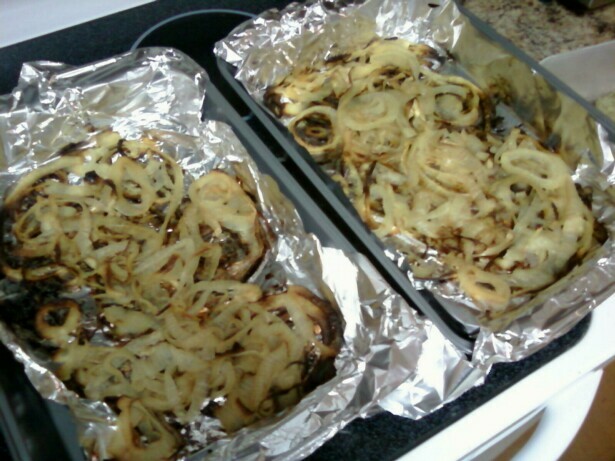 Fluff and fold in caramelized onions. Sorry i don’t have a prettier picture! i’ve just been eating it out of the pot all weekend! Enjoy! 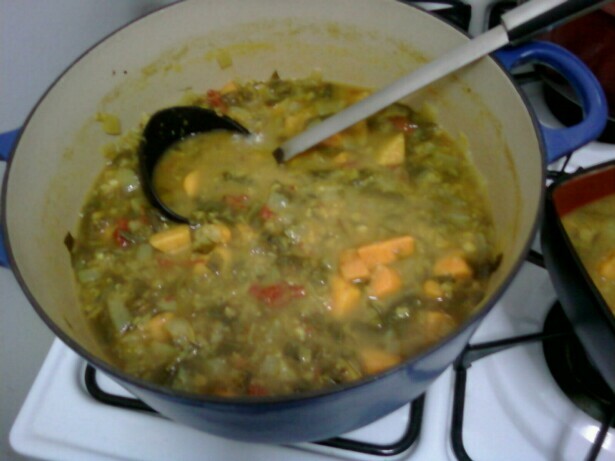 ok, this is a recipe based loosely off the kind diet‘s sweet potato & lentil stew, just re-invented to suit my taste, pantry and nutritional needs. i served it over quinoa, and they suited each other nicely. what’s nice about quinoa is it’s a whole grain, and it only takes 10 minutes to cook. i LOVE brown rice, but i also love 10 minute readiness. 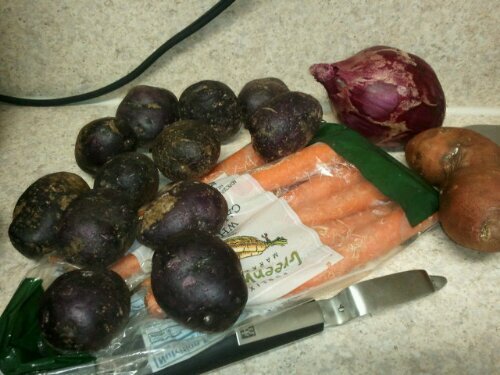 there is something i find incredibly soothing about prepping ingredients. you’ll always see them all nice and neat on my counter, just like the cooking shows. it takes the stress out of cooking when you know everything is all ready to go in. 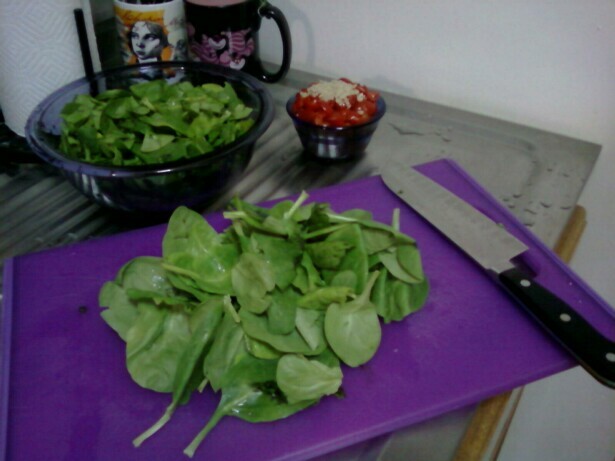 spinach! my bag of spinach was on it’s last leg and needed to be put to use. spinach has all kind of good stuff like calcium, folate, and vitamin A. but it also has iron! and as someone who’s been borderline anemic since childhood, i try to include it into my meat-free diet. hi mom! Kombu! kombu is a type of seaweed. it comes in dried strips. it’s great to soak with dried beans to tenderize them, which makes them more digestible. 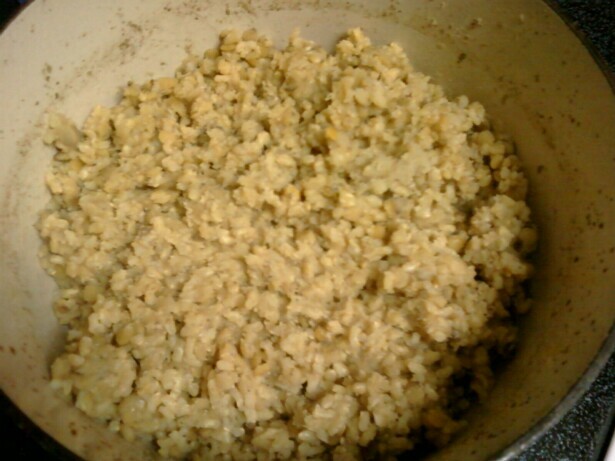 (read: less gas) this is the method used in macrobiotic cooking. it’s also got fiber, sodium, calcium, magnesium, and potassium. sea vegetables are also said to protect against, and counter the effects of radiation. apparently you can also boil a strip in 4 cups of water to make a stock. convenient… this recipe called for 7 cups of vegetable broth, and i only had 1.5 c. i just soaked it for about 10 minutes and then cut it into inch size pieces, and put it back in the water until i was ready to use it. (it would cook further in the pot anyway.) next time i will just soak it with the veggie broth. besides that, i upped the spices quite a bit. i like cinnamon in food. so if you don’t, you can use half a teaspoon, or omit it entirely. 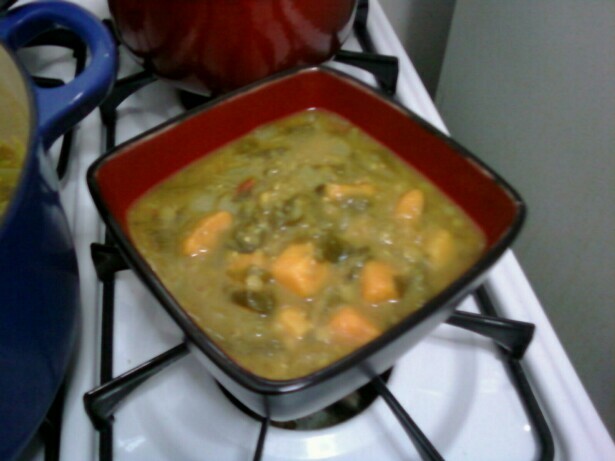 this stew is also amazing with a cup of butternut squash added in with the sweet potatoes. 1. if you decide to use the kombu, just put it to soak in 2 c. of the vegetable broth for about 10 minutes. it will rehydrate and turn the color of cooked green peppers. take it out, slice into 1″ pieces, and return to broth. 2. heat oil over medium heat in a large dutch oven. add onion and garlic, stir for 2 minutes. stir in tomatoes and ginger, and cook for 3 more minutes. now add sweet potatoes, spinach, broth, spices and lentils. 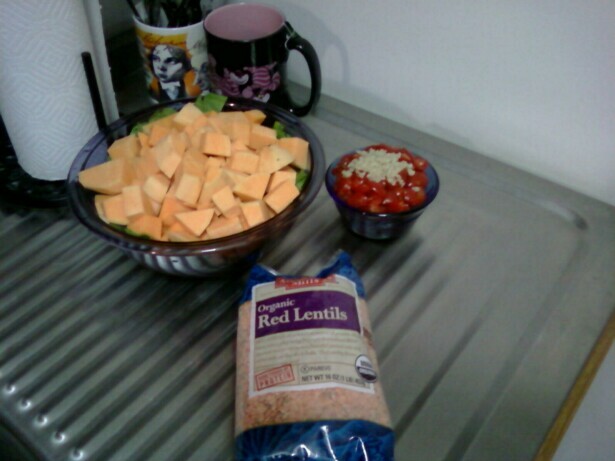 let it come to a boil, reduce heat and simmer for 40 minutes, or until sweet potatoes and lentils are tender.